Norio Ohga, one of the handful of men who shaped Sony into the global consumer electronics giant that it is today, died on Saturday morning in Tokyo at the age of 81, Sony said. Ohga began working as an advisor for Tokyo Tsushin Kogyo, as Sony was originally called, in 1953 when the company was just seven years old. With his classical music training, Ohga consulted on development of the company's first audio products. In 1959 he traveled to the U.S. on a business trip with Sony founder Akio Morita. It was during that trip that Morita persuaded Ohga to join Sony full-time, telling him, "You were born to be a businessman." Ohga's love of music and keen ear for quality audio would define his career and play a key role in Sony's establishment as a leading name in the audio industry. 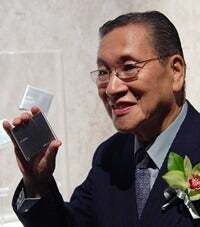 After joining the company, he headed its tape recorder division and it was Ohga's desire to listen to music while he walked -- so the story goes -- that led to engineers developing the Walkman. But perhaps Ohga's biggest contribution to Sony came in 1980, when he led a team exploring technologies to replace analog audio cassettes. The team, working with Philips, developed the Compact Disc and changed the way the world enjoyed pre-recorded music. Sony's first CD player was introduced to the world in October 1982 by Ohga, a month after he became president of Sony. He went on to push development of other audio formats including the MiniDisc and Super Audio CD, but both failed to match the popularity of the CD. Ohga added CEO to his title in 1989 and led Sony through its expansion into the gaming business and the introduction of the PlayStation. He became chairman and CEO in 1995, and was chairman from 2000 until his retirement in 2003. Sony's current CEO, Howard Stringer, paid tribute to Ohga in a statement. EO," said Stringer. "His numerous and successful endeavors were well-known both inside and outside of Sony. Witnessing Ohga-san's leadership firsthand was truly an honor, and one I continued to enjoy and benefit from in countless ways in the years that followed." Stringer also touched upon the work Ohga did to expand Sony beyond the hardware business. Ohga established CBS/Sony Records as Japan's largest record company and later led the acquisitions of CBS Records (now Sony Music Entertainment) in 1988 and Columbia Pictures Entertainment (now Sony Pictures Entertainment) in 1989. "By redefining Sony as a company encompassing both hardware and software, Ohga-san succeeded where other Japanese companies failed. It is no exaggeration to attribute Sony's evolution beyond audio and video products into music, movies and games, and subsequent transformation into a global entertainment leader to Ohga-san's foresight and vision," Stringer said. Ohga played an important role in the wider world of Japanese business, serving on major industry groups and trade bodies, and was active in Japan's classical music scene. He was appointed chairman of the Tokyo Philharmonic Orchestra in 1999.